Can Cambodian Deal End Year-Long Standoff? Even with an agreement in place, a lack of detail may send the opposition back into the streets. The Cambodian government and opposition have struck a deal to end a year of post-election political fighting that has left at least seven people dead and many more injured, in jail, and before the courts. But analysts are warning the agreement – reached shortly before seven senior figures from the Cambodian National Rescue Party (CNRP) were released on bail – was vague, lacked substance, and could offer no more than a lull in the protests that have dominated the political landscape. The CNRP insists it was cheated out of last year’s general election and has maintained demonstrations, despite a crackdown on dissent by Prime Minister Hun Sen around Freedom Park in the heart of the capital. Government forces, in particular the Duan Penh District Security Guards, have a well-earned reputation for brutality, but CNRP protests went awry last week when supporters within its ranks allegedly attacked security guards, resulting in the arrests of opposition leaders. They were bailed out as a deal was struck. Importantly the agreement also signals an end to the CNRP’s year-long boycott of the National Assembly. “The two parties agree on a political resolution by working together in the National Assembly institution in order to reach solutions for various national issues in accordance with democracy and the state of law,” the CNRP and ruling Cambodian People’s Party (CPP) said in a joint statement. Hun Sen had already agreed to an array of positions; on government committees to be filled by the opposition, parliamentary reforms and to investigate allegations of violence by both sides, but crucial to this deal was reform of the National Election Committee (NEC). Under the deal, the NEC – which CNRP leader Sam Rainsy accuses of excessive bias towards the CPP – will have nine members, four to be chosen by the CPP and four from the CNRP. A ninth member is to be elected by members of the National Assembly. He said details about a television license for the CNRP, the next election date, release of a further eight political activists, and investigations into allegations of election rigging and the brutal crackdown were lacking. In January protests turned dramatically violent after unions, demanding a substantial increase in the minimum wage, joined forces with the CNRP. 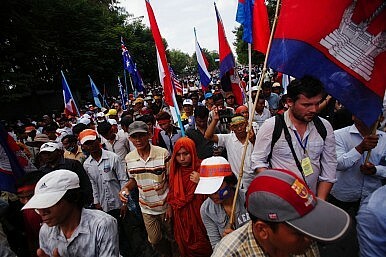 Dave Welsh, head of the U.S.-based labor group the Solidarity Center, said it was a hopeful sign that the CNRP would head parliamentary committees focusing on human rights and labor issues. But he added it was a concern that there was no real mention of issues directly relating to labor, and he urged the opposition to keep its word on pushing the government for higher pay and finding justice for those who lost their lives in the demonstrations. “If those issues, namely around a living wage, and some accountability/redress for the violence which took place against workers over the past eight months aren’t addressed, regardless of the political climate going forward, good or bad, workers – specifically garment workers – are likely to repeat protests which occurred last January,” he said. His sentiments were echoed by Virak. “While I think this agreement favors the CPP, particularly coming at the time when the CNRP’s arms are seen to be twisted to agree to this, for the CNRP, there is nothing stopping them from walking out of Parliament in the future and going back to the street, now with parliamentary immunity,” he added. The CNRP had resisted calls by some independent analysts, including independent observers like UN human rights envoy Surya Subedi and prominent Cambodian academic David Chandler, to end their boycott. NGOs sympathetic to the opposition have also been adamant in defending their accounts of events and in justifying the actions of CNRP supporters when confronted by security guards. However, one has apologized.